Nigeria world cup talisman, Ahmed Musa has thanked all his fans who voted his goal to be the FIFA’s best goal of the 2018 World Cup, noting that the goal was indeed bigger than him. Musa extended his thanks to all even though failed to win the 2018 FIFA World Cup Best goal award. 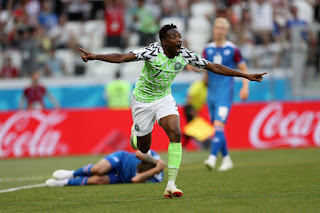 Musa’s second goal in Nigeria’s 2-0 win against Iceland was among the 18 nominated for the goal of the tournament award by FIFA. The goal, however, came 8th in FIFA’s selection. France defender, Benjamin Pavard won the vote for his stunning strike in the Les Bleus’ second round 4-3 win against Argentina. The Leicester City forward said, “I just want to thank you all for voting. This goal is bigger than me, it has shown the world that Nigeria has quality on the world stage and we look to improve in the future. I am humbled by the love and encouragement. “Thank you all again,” Musa wrote on his Twitter handle.